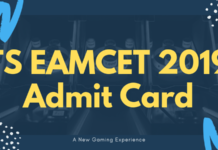 Telangana State Engineering, Agriculture and Medical Common Entrance (TS EAMCET) is being conducted by JNT University Hyderabad (JNTUH) on behalf of Telangana State Council of Higher Education (TSCHE). This state level examination is the prerequisite for admission into various professional courses offered in University / Private Colleges in the state of Telangana and held once in a year. The exam has been held for admission in Agriculture, Engineering, and few Medical courses. Only the college of Telangana State will participate in the exam. Check TS EAMCET syllabus, exam pattern, and more details from this page. Under TS EAMCET Engineering covers Bio-Technology, B.Tech (Dairy Technology), B.Tech (Ag. Engineering) and B. Pharmacy, B.Tech (Food Technology (FT) Courses. Whereas, Agriculture and Medical category the covered courses are B.Sc. (Hons.) Agriculture / B.Sc. (Hons.) Horticulture/ B.Sc. (Forestry) / B.V.Sc. & A.H. / B.F.Sc. and for remaining 50% seats in B.Tech. (FT) Courses. Hyderabad West Zone – Kukatpally, Patancheru, Gandipet, Moinabad and surrounding areas. Hyderabad North Zone – Medchal, Gandimaisamma and surrounding areas. Hyderabad Central Zone – Abids, Tarnaka and surrounding areas. Hyderabad East Zone – Ghatkesar, Keesara and surrounding areas. Hyderabad South-East Zone – L.B. Nagar, Hayathnagar, Pedda Amberpet, Ibrahimpatnam, Ramoji Film City area and surrounding areas. 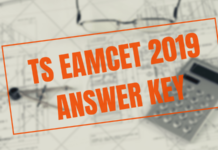 TS EAMCET Practice Test for 2018 is available now. Candidates must practice these tests to get an idea about their preparation. These Practice tests familiarized you with the pattern of the exam and helps strategies your planning for the Examination. Practice Test: Click here to download Practice Test for TS EAMCET. The TS EAMCET exam will be an objective type exam which will be conducted in the offline mode. It will comprise of 160 multiple choice questions and the duration of the exam will be of 3 hours duration and the subjects asked in the exam will be Physics, Chemistry and Maths. Candidate will be awarded 1 mark for every correct response. The table below comprises of the official stats of the candidates who appeared for the TS EAMCET exam and qualified the exam.